In my previous post, our emphasis regarding this passage was that it described things the Apostle John knew, not simply through His mind, but through His experience with Jesus Christ. My point was that we, too, should espect to have similar “knowings” to share those things in Him we have and are experiencing. So as our relating to Jesus through this sweet, sweet fellowship increases as we live in Him, then we will also have much to share that has been born through our experiences in Him. Many believe that anything emotional or experienced cannot be trusted. Well, that is a bit of a problem, since it has been proved that how we think determins what we feel. So emotions that are governed and as a result of working in Jesus through the Spirit as revealed in the Word will produce Godly emotions. This is experiencing Him and it sounds emotional – and it is, however, it is brought about through the Word. We need not discard what we feel, but instead examine our thought patterns – that is where the proof of emotions can be found. We should be having good, healing and releasing emotions as we walk in His love. These provide us with ample testimonies about Him and what He does in us. (This finishes that post. I did not realize I had not written well on that aspect of the passage. My apology to all who wondered where the remainder was). Now, for this post. The word “fellowship” reflects sharing, participation, partnership, etc…. John 17:20-23 “”I do not pray for these alone, but also for those who will believe in Me through their word, that they may all be one, as You, Father, are in Me, and I in You. May they also be one in Us, that the world may believe that You have sent Me. I have given them the glory which You gave Me, that they may be one even as We are one: I in them and You in Me, that they may be perfect in unity, and that the world may know that You have sent Me, and have loved them as You have loved Me. (http://bible.com/1171/jhn.17.20-23.mev) This passage describes what John is describing here. When Jesus finished the work of the death, burial, resurrection, ascension and then the outpouring of the Holy Spirit, He provided this abundant fellowship that He had prayed about in this prayer for believers who would come. It was not a form of “church” that He came to bring, but Himself (and the entire God-Head) that He came to give. It was not form that would make us right, but it was His “right” that would create within us His righteousness and the capacity to fellowship in Him at such a deep level that we share all in Him. It is this fellowship that the Apostle John desires to share with them, so that their (everyone’s) joy will be complete. I will write of that -“joy” and “complete” in another post. Lord, we come as those whose lives have been totally impacted by your love and care. We seek to draw near is such a totalness that we are able to allow your fellowship in through participation in You and with You. It is You we long to embrace. Make it so. Thank you! Getting Ready for the Conference, just checking to see if my blogging program is working well and publishing accurately. Tomorrow we have the yearly Elim Business meeting at 2 pm and since I have credentials with Elim, I am qualified to participate by confirming the decisions of the elders. It is an important business meeting as our current president, Ron Burgio, is leaving to go back into the pastorate full-time and Chris Ball has been selected by the Elders to be the new president. Chris ordained me and I he and his family are friends. I look forward to a fruitful time for him and Elim as he takes the reins and works in the vision of God for Elim. It is an exciting time. At 7 pm we join together in worship and then both Ron and Chris will be our evening speakers. It should be a very, very good time. I will try to get a summary here for you. Right now my time is turning to packing and getting all ready to go. Joe is going with me as are four other folk representing Psalm 19 and New Heart Ministries. It should be an outstanding time in our Lord, with one another and with the saints who gather for Conference. Looking forward to seeing many friends. The Lord is very, very good. yard look marvelous, spends it days and is no more, then it is time to have something else planted to take its place in the color department. Growing plants take time to envelop a garden. We must learn to wait on them, care for them and enjoy the journey. It is called diligence. Diligence is not a word we know much about in our modern life-style, but this morning as I was taking my regular reading and prayer time with the Lord Jesus, He reminded me about a missionary I know. She was sent to a particular province in a far eastern nation to plant a church as that province did not have one. So she went full of excitement and encouragement to bring many to Christ and establish the local church. She arrived and rented a house with a large front room. She turned that room into the meeting room, set it up like a church, piano and all. She advertised her service through-out the village and was excited for the day to come. The Sunday came that she had advertised that she would begin services. She lived in the back part of the house, so she came into the front part early to greet the people. The beginning time came and went, but the people did not come. So she sat down at the piano and began to worship the Lord. After the period of time she had planned for worship, she stood and delivered her message to the empty seats. She continued doing this Sunday after Sunday, week after week, month after month. Even after she made friends and people knew who she was and what was happening, still no one came. Or so she thought. Since it was mild outside, she always had the windows open in the “church room.” She had no way of knowing that early in these months, the children of the neighborhood began to come under the open window to hear the songs and the stories. They were hidden from her view and were so quiet that she did not know they were there. At first it was the younger ones, then the older ones. By the time she discovered them, she had been having “church” for her supposedly empty chairs for almost two years. When it came time for her to leave that post and go to her next missionary assignment, she was replaced with a dedicated couple who were to pastor her very special church full of people who loved the Lord. Thank you Lord that you measure things very differently that we do. Teach us to number our days only in You and allow You to measure out the results as supply. The harvest is always bountiful and never skimpy. Thank you Lord for such love and increase. So as we look to flower beds (appointed work) not yet full of color. Let’s remember to be faithful to care for them (to be diligent in what has been assigned) and allow the Creator to make all beautiful with our small seed efforts. We have such a marvelous Lord! The Word of the LORD continues to unfold itself as the answer to all we need in every dimension of life! I am constantly amazed at what I read. This verse is very precious and we will only do the first half in this post. The word “statutes” or “precepts” as some translations have it means something that is properly appointed, or a mandate of God hence may well be translated “commandment” also. This entire section of the Psalm is telling us about the joys of the Word using various words to let us know the author is talking about the same thing over and over again. Here this utterance from God is right or “upright” or “straight”. He is not duplicitous in any way, but is a “straight shooter” we would say out West. What He says is right, always right and never ever wrong in any form at all. Nor does He lead in any way other than ways of goodness and life. This “right” word causes the “heart” or inner man of heart, will and emotion to possess great joy or in this case “happiness.” This is really worth pondering (or meditating upon). The utterances of God cause our inner person to have great joy or happiness. The secret for the believer to have a happy life full of joy is to have the Word of God in them all the time. To think on it, to ponder it, to trust in the one who is saying it – our God speaking to us. How can words on a page do that? Simply because they are not just words on a page, but instead they are the very breath of God given to us for life and joy and peace in the Lord Jesus! Yes, yes and yes. Lord may we treasure Your Word so deeply that Your well of abundant life deposited deeply within our inner person will rise in joy and receive in love all You have spoken for us to treasure. Thank You that Your Person and Your Voice are the source of our ability to possess and give away joy. To my Readers: All passages from NKJV. 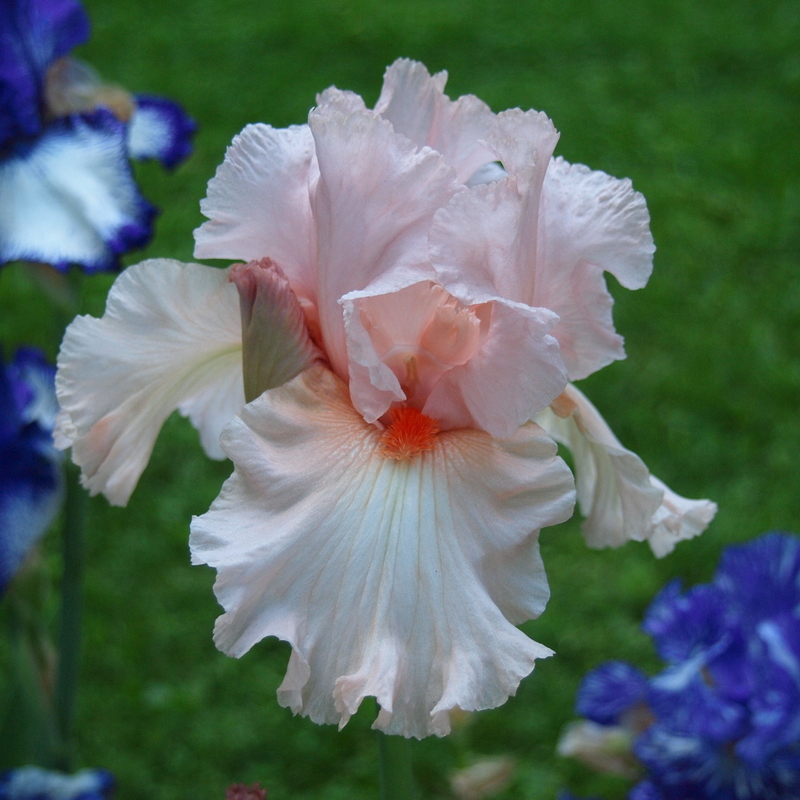 Also, I just wanted to share one more iris with you. Thanks so for reading and for being such a blessing in my life. As you can see from the header and this insert, my iris’ are really lovely this year. I am enjoying them so very much. I have recently added other flowers to the beds, as soon the iris’ will have completed their flowering time, we will need color then. I am enjoying it all. Now to the Word. The word “testimony” means just that. In our understanding one’s testimony means the story of their walk with the Lord. In Hebrew, it is always a reference back to the Torah – the Law of YHWH. However, even if we add a bit of our understanding to it, the entire Word of the LORD is the story of our His faithfulness. He is always faithful and can never be unfaithful to His Word in any way. Hence, when we continue on with the next word, this helps us understand what the Word is actually saying. The word “sure” in Hebrew is actually the word “believe” if translated literally. This is where Bible translators (we must honor them and pray for them for it is a very difficult job) have to know the “sense” of the Word beyond its literally meaning. It most generally is used in Hebrew to indicate “support,” “security,” “confirmation.” So we see the way the NKJV translated it, “sure” is very good. The story of the LORD’s faithfulness makes us very secure. It eliminates fear and anxiety in every way. The answer for all fear in the heart is to trust the LORD and His faithfulness. “Making wise,” is to be wise, or to become wise. In other words, to trust the LORD and His Word is to become wise. The last word in this phrase is “simple,” or “foolish.” It means just what it says. To trust the LORD and His Word is to make one who is foolish or lacks understanding become a wise one. What marvelous facts stored for us in opening our hearts and using our minds to read, study and meditate on the Word of Almighty God. With the Lord Jesus and the Holy Spirit inside of us, we already have this Word written on our hearts and in our minds (Jeremiah 31:31-34 and also in Hebrews 8 & 10). All we need to do is avail ourselves of the opportunity to invest ourselves in Him through His Word. If we study out “wisdom” in the Scripture, we will find it is always a gift from the Lord and never a result of getting old or educated by various trials. Wisdom is always available to anyone who will ask, according to James. However, when we love the Lord Jesus and want to know Him more, then we turn to the Word because the knowledge of God is contained there. Let’s do it! Let’s begin to trust what we read and study and begin to meditate on it in our minds. It is for us. Have a blessed day in His wonderful love and wisdom! 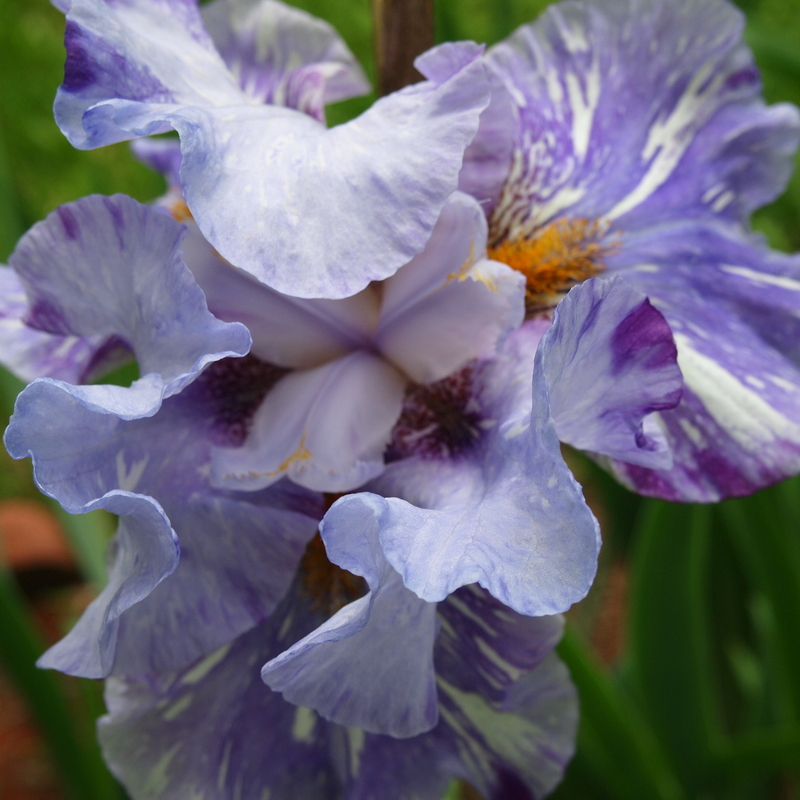 As you can clearly see from my header, my iris’ are in full bloom and just beautiful. I have several varieties as they have come to me as gifts from dear friends. My neighbors really enjoy them too. Thank you Friends. They possess such a fullness of beauty. (I would like to “unpack” this for us today. I am consulting an interlinear of the Hebrew and English so I can understand the dimensions of the words in the original Hebrew. For those of you who love to study this way, I recommend to you Biblos.com and its Biblehub. It is an outstanding full Bible program totally on-line. I go to the interlinear section and have it take me to the correct passage. Play around with it for a while; you will be glad to have this easy resource which can be used in any device with an internet connection). The Word of God reflects the nature of its author and source, Almighty God. He is a dimensional being; meaning you can’t really ever discover all He is. He is always the same and at the same time so deeply vast as to not be simply nor complicated. He will always give us just as much of Him as we desire. Our concepts of that are so limited as sometimes to be laughable, yet in love He continually gives all our beings can receive. Since we are created in His image, we too are dimensional beings. We have relationships that are deep and intimate. At the same time, we have relationships that are shallow and deal only in surface matters. As He is in relational matters, so are we. That being true, when we write, we write out of who we are what we think. So the writing can be shallow or deep, warm or cold, revealing or hidden. Therefore, we need to know that the Word of God written in our Bible is also dimensional. To truly get dimensional understandings, we must take the time to study deeply and that is normally done through the original languages. These helps are so available to all of us now, that I just recommend you begin to do some of it and allow your heart to be enriched by what you find. The Word is magnificent, just like our God! “The instruction of the LORD…;” the word used here is literally YHWH, or the covenant name our Father revealed to Abraham in Exodus. We commonly understand this as “I Am that I Am.” This is also the term in the Greek that Jesus often used for Himself. So the identity of the person doing the instruction is clear. The word used for “soul” can also mean, “living being, “life,” “self,” “person,” “desire,” “emotion,” appetite,” “passion.” So we could read, “The instruction of YHWH is complete, turning back the person (or emotion, or passion, or self etc…). The sense is that it returns one from what has been harmful and brings them back to what is restorative and therefore refreshing. Now we understand that, every thought, every feeling, every appetite, literally everything is brought into wholeness by a good dose of the Word of our God. That’s right, the Word infused with the Holy Spirit who lives within us is able to bring into clarity and sweetness everything about us. I wonder why we look so hard for quick-fixes instead of spending quality time reading and processing the Word of God? Something to think about. Lord, we are yours. In your love, mercy and grace, show us these truths. Ground us solidly in a Spirit-understanding of these powerful words of life. Thank you. I just wanted to share a bit of joy with everyone. I was out this morning and caught some daffodils and tulips at the local 911 Memorial site in Dewitt. 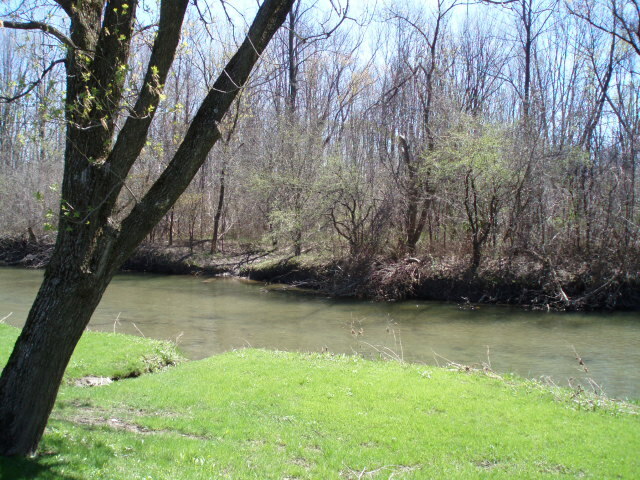 Then I walked over to the park and the little pond and further to see the portion of the old Erie Canal. I put the daffodils up on the header, but thought this early spring scene of the Canal really nice. It was in the 50’s and breezy, so a bit chilly, but overall a nice walk and the sun was so welcome. I believe it has been 12 days since we have had much it. Tomorrow its supposed to be nice too. Enjoy each season with your Lord, whatever that may be. I, personally love them all – especially Spring and Fall. They are so beautiful here in Central New York. Thank you Lord for green. It was a long winter.